Holy Trinity, fresco by Luca Rossetti da Orta, 1738-9 (St. Gaudenzio Church at Ivrea, Torino). Trinity Sunday is celebrated in all the Western liturgical churches: Roman Catholic, Anglican, Lutheran, Presbyterian, United Church of Christ, and Methodist. The Sundays following Pentecost, until Advent, are numbered from this day. In traditional Catholic usage, the First Sunday After Pentecost is on the same day as Trinity Sunday. In the revised Roman rite, Ordinary Time resumes one week earlier, on the Monday after Pentecost, with the Sundays that would otherwise fall on Pentecost and Trinity Sunday omitted that year. In the Church of England, following the pre-Reformation Sarum use, the following Sunday is the "First Sunday after Trinity", while the Episcopal Church in the United States of America (ECUSA) now follows the Catholic usage, calling it the Second Sunday after Pentecost. The liturgical colour used on Trinity Sunday is white. In the Catholic Church it is officially known as the Solemnity of the Most Holy Trinity. Prior to the reforms of the Second Vatican Council, it marked the end of a three-week period when church weddings were forbidden. The period began on Rogation Sunday, the fifth Sunday after Easter. Trinity Sunday was established as a Double of the Second Class by Pope John XXII to celebrate the Trinity. It was raised to the dignity of a Double of the First Class by Pope Pius X on 24 July 1911. During the Middle Ages, especially during the Carolingian period, devotion to the Blessed Trinity was a highly important feature of private devotion and inspired several liturgical expressions. The currently prescribed liturgical color is white. In the traditional Divine Office, the Athanasian Creed (Quicumque vult) is said on this day at Prime. Before 1960, it was said on all Sundays after Epiphany and Pentecost which do not fall within Octaves or on which a feast of Double rank or higher was celebrated or commemorated, as well as on Trinity Sunday. The 1960 reforms reduced it to once a year, on this Sunday. In the 1962 Missal, the Mass for the First Sunday After Pentecost is not said or commemorated on Sunday (it is permanently impeded there by Trinity Sunday), but is used during the week if the ferial Mass is being said. The Thursday after Trinity Sunday is observed as the Feast of Corpus Christi. In some countries, including the United States, Canada, and Spain, it may be celebrated on the following Sunday, when parishioners are more likely to attend Mass and be able to celebrate the feast. The Athanasian Creed, although not often used, is recited in certain Anglican churches, particularly those of High Church tendency. Its use is prescribed in the 1662 Book of Common Prayer of the Church of England for use on certain Sundays at Morning Prayer, including Trinity Sunday, and it is found in many modern Anglican prayer books. It is in the Historical Documents section of the 1979 Book of Common Prayer (Episcopal Church), but its use is not specifically provided for in the rubrics of that prayer book. Trinity Sunday has the status of a Principal Feast in the Church of England and is one of seven principal feast days in the Episcopal Church. Thomas Becket (1118–70) was consecrated Archbishop of Canterbury on the Sunday after Pentecost (Whitsun), and his first act was to ordain that the day of his consecration should be held as a new festival in honour of the Holy Trinity. This observance spread from Canterbury throughout the whole of western Christendom. Anglican parishes with an Anglo-Catholic churchmanship observe Corpus Christi on the following Thursday, or in some cases the following Sunday. Almighty and everlasting God, who hast given unto us thy servants grace, by the confession of a true faith, to acknowledge the glory of the eternal Trinity, and in the power of the divine majesty to worship the unity: We beseech thee to keep us steadfast in this faith and evermore defend us from all adversities who livest and reignest, one God, world without end. Amen. Almighty and everlasting God, who hast revealed thyself as Father, Son, and Holy Spirit, ,and dost ever live and reign in the perfect unity of love: Grant that we may always hold firmly and joyfully to this faith, and, living in praise of thy divine majesty, may finally be one in thee; who art three persons in one God, world without end. Amen. Trinity Sunday is the Sunday following Pentecost, and eight weeks after Easter Sunday. The earliest possible date is May 17 (as in 1818 and 2285). The latest possible date is June 20 (as in 1943 and 2038). 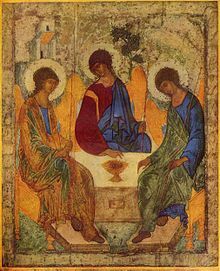 The Holy Trinity by St. Andrei Rublev, using the theme of the "Hospitality of Abraham." The three angels symbolize the Trinity, which is rarely depicted directly in Orthodox art. In the Eastern Orthodox and Eastern Catholic churches, the Sunday of Pentecost itself is called Trinity Sunday (the Sunday after Pentecost is All Saints Sunday). The Monday after Pentecost is called Monday of the Holy Spirit, and the next day is called the Third Day of the Trinity. Though liturgical colours are not as fixed in the Eastern practice (normally there are simply "festive" colours and "somber" or Lenten colours), in some churches, green is used for Pentecost and its Afterfeast. Johann Sebastian Bach composed a number of cantatas for Trinity Sunday. Three of them are extant, including O heilges Geist- und Wasserbad, BWV 165, Es ist ein trotzig und verzagt Ding, BWV 176, and Gelobet sei der Herr, mein Gott, BWV 129. The cantata Höchsterwünschtes Freudenfest, BWV 194, composed for dedication of the church and organ at Störmthal, was performed again in Leipzig for Trinity Sunday, first on 4 June 1724, a shortened version in 1726, and the complete version in 1731. ^ "Christianity: The Trinity". BBC. BBC. Retrieved 2016-05-20. ^ "Trinity Sunday/First Sunday after Pentecost". United Methodist Church Discipleship Ministries. Retrieved 17 March 2016. ^ a b c The Book of Worship for Church and Home: With Orders of Worship, Services for the Administration of the Sacraments and Other Aids to Worship According to the Usages of the Methodist Church. Methodist Publishing House. 1964. p. 131. Retrieved 25 March 2017. Wikisource has the text of the 1911 Encyclopædia Britannica article Trinity Sunday.